Perhaps best known for taking over Mad magazine’s Spy vs. Spy (beginning in 1997), Peter Kuper is a New York alternative cartoonist and graphic novelist. 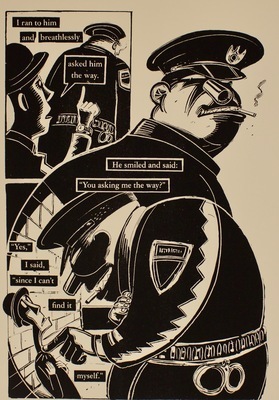 The suite of screenprints on display is based on Kuper’s 1995 graphic novel of the same name—which in turn appropriates a short (126-word) literary work by Kafka. Kuper, who has been a visiting artist at UND, produced this print in the Department of Art & Design’s printmaking facility with the assistance of students. By working alongside professional artists, UND students are provided with unique learning opportunities. The students’ collaborations with visiting artists have been enhanced through Sundog Multiples—a printmaking venture created by Art & Design Professor Kim Fink, in conjunction with UND Art Collections, and generously funded by the Myers Foundations.